If you are looking how to best get from Copenhagen (CPH) Airport to the city center of Copenhagen then you are in luck. Transportation options such as the train, metro, bus, taxi, and Uber make it easy for you to reach your destination. Since the airport is only about 8 kilometers (5.0 miles) south of the city center, you will be at your destination and enjoying the city in no time. If you want to reach Copenhagen Central Station quickly from CPH Airport, then taking the train is by far your best option. The entrance to the train station is located near the end of Terminal 3. From the arrivals exit of Terminal 3, walk straight across the terminal. At the end of the terminal, follow the signs towards Track 2 for Copenhagen Central Station, Nørreport, Østerport, Helsingør, Fyn and Jylland. Take the moving walkway down towards the train tracks where you can board the next train. You do not need to validate your ticket or pass through any gate, just make sure you have your ticket in hand in case any employees or officers ask. During the day the train runs every 10 minutes while at night it runs about 1 to 3 times per hour. It takes about 13 minutes to reach Copenhagen Central Station from CPH Airport. Tickets for the train can be purchased at machines in the baggage claim area or machines near the DSB ticket sales counter inside Terminal 3. These machines only accept coins, some credit cards, and most debit cards with PIN. You may also purchase tickets at the DSB ticket sales counter inside Terminal 3. Similar to the train, the metro is a great way to reach destinations in central Copenhagen other than Copenhagen Central Station. The entrance to the metro station is located near the end of Terminal 3. From the arrivals exit of Terminal 3, walk straight across the terminal. At the end of the terminal, follow the signs for the metro and take the escalator up one level. Continue straight to reach the entrance to the metro. The airport station is a terminal station of Line M2 on the Copenhagen Metro. Don’t worry about getting on the wrong metro train as all trains departing from here head in the same direction. The metro heads towards Vanløse Station with stops in central Copenhagen such as Nørreport Station and Christianshavn Station. The metro does not stop at Copenhagen Central Station. During the day and evening, the metro runs every 4 to 6 minutes. At night the metro runs every 15 to 20 minutes. 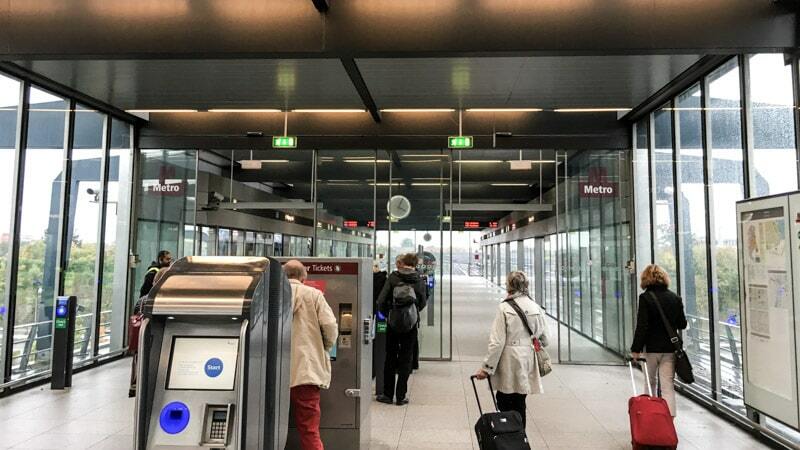 Tickets for the metro can be purchased at machines in the baggage claim area, machines near the DSB ticket sales counter inside Terminal 3, or at the entrance of the metro station. These machines only accept coins, some credit cards, or debit cards with PIN. You may also purchase tickets at the DSB ticket sales counter inside Terminal 3. An alternative to the train and metro is the bus. From the arrivals exit of Terminal 3, make an immediate left and exit the terminal. Once outside, continue straight in the direction of Terminal 2 until you see the line of buses waiting on your right. If your intended destination is Copenhagen Central Station, City Hall Square, or Nørreport, then your best option is Bus 5A. Bus 5A takes about 30 to 35 minutes to reach Copenhagen Central Station and runs about every 10 minutes during the day and less often at night. Tickets for the bus can be purchased at machines in the baggage claim area or machines near the DSB ticket sales counter inside Terminal 3. These machines only accept coins, some credit cards, or debit cards with PIN. You may also purchase tickets at the DSB ticket sales counter inside Terminal 3. If you have coins, you can also purchase tickets directly from the driver on the bus. Using a taxi is a great way to get to destinations across Copenhagen, especially for those who need direct access, those in groups, or travelers with extra or heavy luggage. Using a taxi is also one of the most expensive modes of transportation. From the arrivals exit of Terminal 3, make an immediate right and exit the terminal. Once outside, the taxi line will be immediately in front of you. Fares vary by your destination, time, and traffic. All taxis accept credit cards. Only some taxis accept payment in Euro or U.S. Dollar. If you want the enjoyment of a tax without the taxi prices, then you can take an Uber from CPH Airport to destinations across Copenhagen. Just as with using a taxi, Uber rates will vary greatly based on your destination, time, and traffic. You can read more about Uber if you are unfamiliar with how Uber works or if it is your first time riding Uber. For $5 off your first three Uber rides, enter promo code at3706ue.